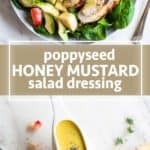 The best Poppyseed Honey Mustard Salad Dressing, made with simple and healthy ingredients. 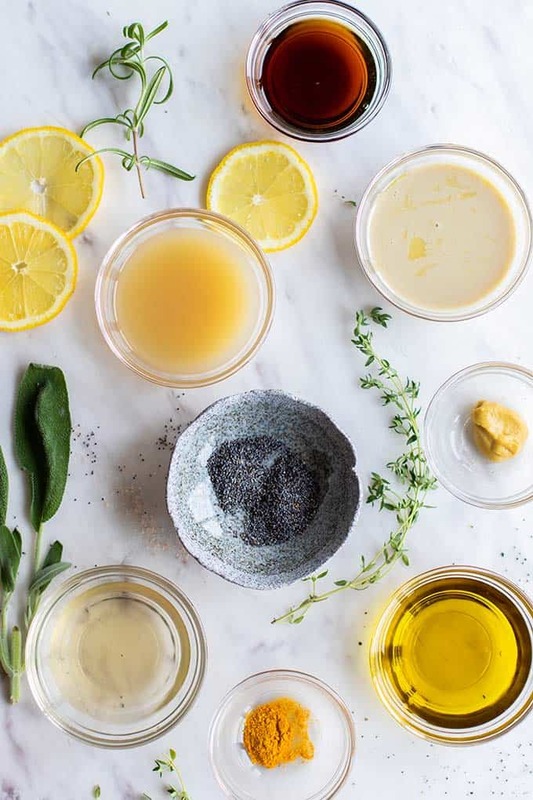 This healthy and creamy homemade salad dressing is great for a variety of salads and as a dipping sauce. Poppyseeds are such a whimsical addition to food, yet they are rarely used. 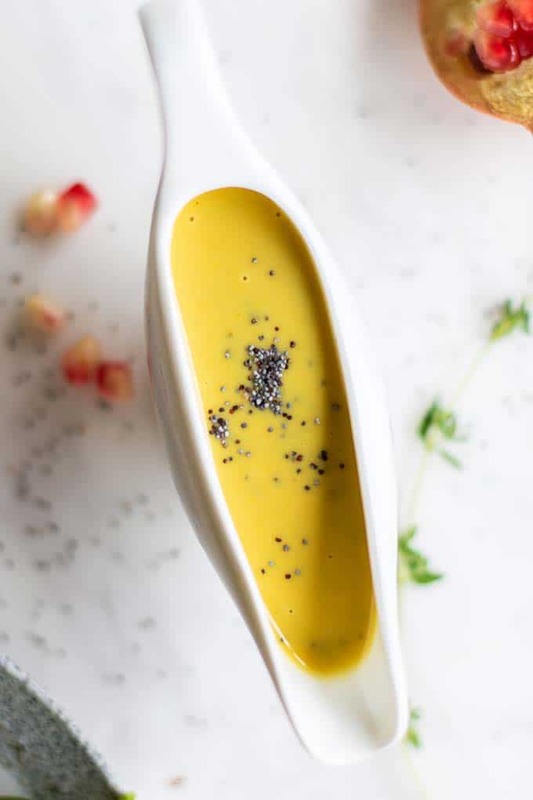 A popular restaurant has a Poppyseed Honey Mustard dressing, and while I can’t say the poppyseeds are what makes it great, they do make it look special. 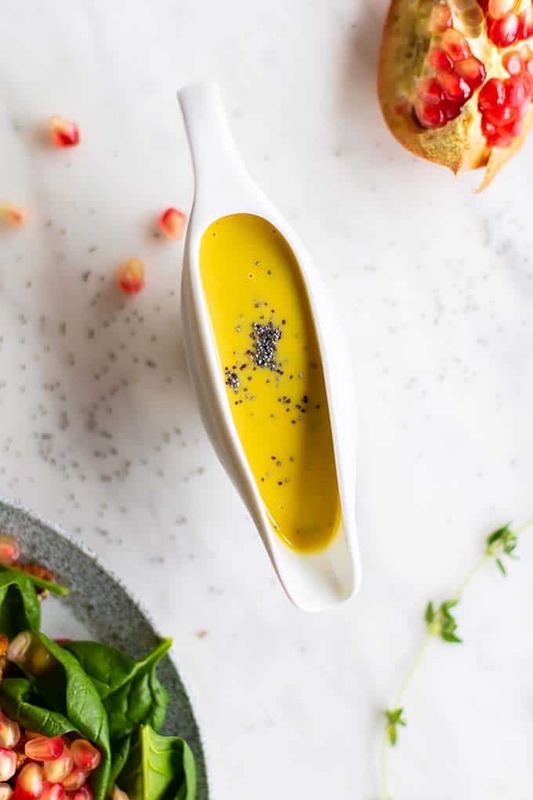 This healthy honey mustard salad dressing is made with just a few ingredients you probably have on hand, and will last for weeks in the fridge, ready to jazz up any salad. I like to brighten up dressings with lemon juice. In my opinion, it makes them so much better than just oil and vinegar based ones! To boost the yellow color, I also added a pinch of turmeric. Rather than using mayo, this healthier version relies on tahini for its creaminess. That easy swap means this is also a vegan honey mustard salad dressing. 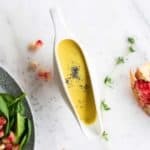 Often I make salad dressings in my blender to get a smooth and creamy consistency, but with this one, I just added everything to a large measuring cup and whisked it until it was extra smooth. Make it however it’s most convenient for you! Chicken and Pomegranate Spinach Salad: Give you spinach salad a whimsical look by drizzling this healthy salad dressing over the top. Pistachio Crusted Chicken Fingers: Use this healthy dressing as a dipping sauce for your favorite chicken tender or nugget recipe. Spiralized Cucumber Chicken Waldorf Salad: Give your veggie noodles a dose of creamy flavor with this healthy dressing recipe! Whole30 Chicken Salad: Put a new spin on a chicken salad recipe. This dressing will make it not acceptable for the Whole30, but still a delicious lettuce wrap or sandwich filling! 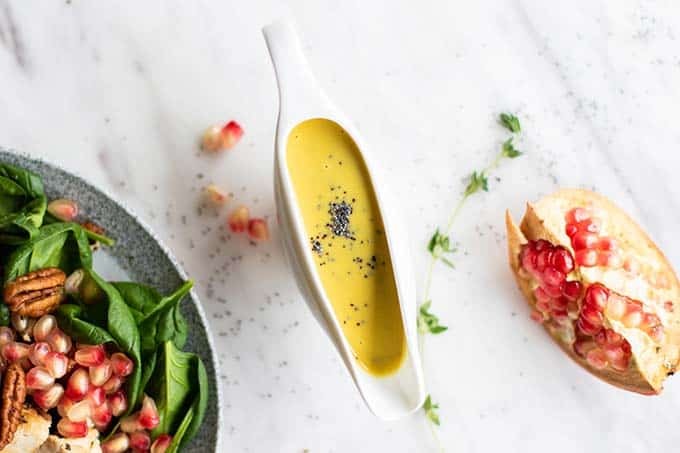 This healthy vegan honey mustard dressing is made with tahini, and is studded with poppy seeds for an extra special touch. Use this on your favorite salad or as a dipping sauce for chicken tenders. Add all ingredients except poppy seeds into a mixing bowl. Whisk until well combined and very creamy. 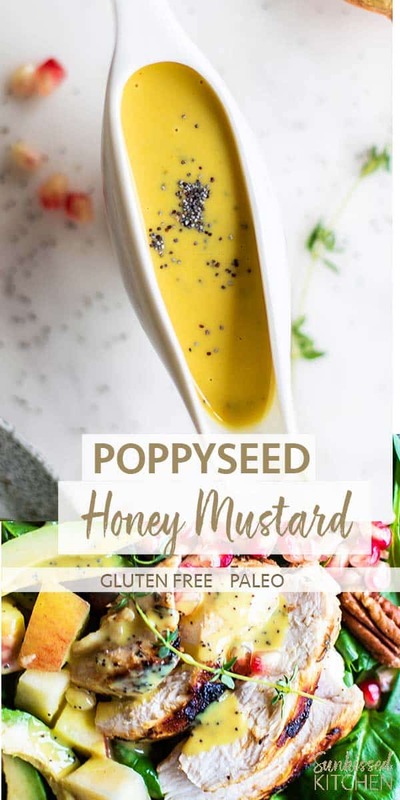 This Healthy Honey Mustard Salad Dressing post may contain affiliate links, meaning if you make a purchase, I will receive part of the sale as a commission. This helps me continue to bring you lots of fresh and inspired recipes!